The Goodwood Festival of Speed has expanded its aviation area, packing in more air displays and static exhibitions than ever before. The Avro Vulcan, Eurofighter Typhoon and Red Arrows will take to the Goodwood skies over the festival weekend, in what should be a dazzling display of aeronautical delight. The expanded aviation exhibition area has been moved to behind the Moving Motor Show area and will feature an assortment of fixed wing and rotary aircraft. As well as getting up close to all manner of aircraft, visitors will be able to pull up a deckchair and enjoy a dedicated bar, eatery and live jazz band. 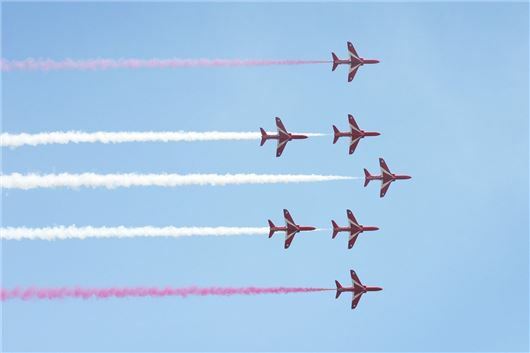 On Friday and Sunday the Red Arrows will be in action, with the Vulcan and Eurofighter Typhoon taking to the skies on Saturday and Sunday respectively.